Organising a day out for your colleagues? Out of team building ideas or suggestions for unusual team building activities? If you are looking for something that guarantees fun and at the same time strengthens morale and camaraderie look no further. Two hours of paintball games with CAPE TOWN PAINTBALL is one of the most fun team building activities there is! The nature of paintball demands strategic thinking and mental/physical stamina. At the same time paintball guarantees that all parties involved will have a fantastic time challenging and attempting to outsmart (read: ambush) one another. This is why it is lauded as one of the best ‘minute to win it’ style games for the office outing or end of year team building function. Why does paintball enjoy a reputation as one of the most popular team building activities for work, as well as team building activities for adults? Think of colleagues or associates playing paintball games as a combination of group therapy and promotion of social relations. Have you had it with that co-worker who takes ages to answer your mails, dumps all his/her work on you or always manages to get the last cup of coffee from the percolator before you? Paintball is your once-a-year chance to release all your frustration on said co-worker(s) in a non-lethal, semi-civilized fashion. No wonder it is regarded as one of the top team building games around – almost like watching one another play the face the cookie game which in itself can be an hilariously funny experience! Similarly, changing up paintball teams throughout the course of the game means that you get to interact with colleagues from other departments – or who hold different positions from yours – that you don’t normally get to liaise with. The pain(t), sweat and smiles during paintball team building activities goes a long way in strengthening interpersonal relations and promoting affinity between individuals through its various team building structures, as it highlights the importance of communication in teamwork and the importance of dependability and relying on each other as a team. As far as safety is concerned, we take every precaution possible to ensure that everyone can BE rest assured of good, not-so-clean fun on the big day. One of our qualified paintball marshals will be on site at all times to ensure that rules are adhered to. We also have CCTV cameras to monitor the game for ultimate safety reasons (and for in case you start arguing about who shot who!). 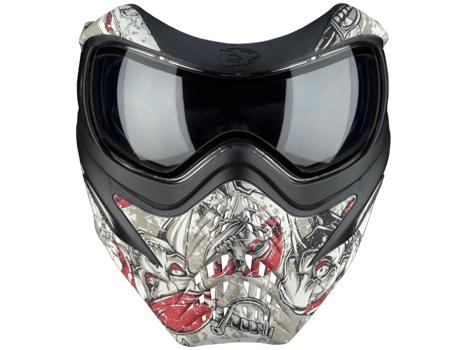 Furthermore, all players are required to wear our state of the art paintball masks for ultimate facial protection during game play. We source only the finest paintball gear and our paintball guns (or paintball markers) are one of the best models on the market to ensure the ultimate experience during team building exercises for work functions. The pain-factor of paintball is an intrinsic factor of the game, but don’t be frightened – getting hit by a paintball only results in a sting and bruises fade after a few days to two weeks. It’s all part of the rush of paintball and survivor games for team building. No permanent marks or injuries can be sustained from getting shot! As long as players stick to the rules at all times and wear protective masks, there is nothing to fear. It’s all part of the fun of paintball games! Our team building games usually last two hours, but we can always make provision for shorter/longer sessions if prior arrangements are made. Find out why paintball is one of the greatest team building exercises there is as well as one of the top resilience games for adults. Contact us today and get in touch with one of our highly knowledgeable paintball managers to start organising the ultimate paintball outing!